Julie and Julia! Marcella and Beatrice? At the end of the movie, the audience claps as a sign of appreciation. The woman next to me turns to me and exclaims, like we are best friends: What a Delight! Indeed, I replied with a big smile! Merryl Streep’s performance is outstanding and makes you forgive her for having done Mamma Mia. During my first forty years, when I lived in Italy, I had never heard of Julia Child nor Marcella Hazan. Well, I was not interested in food, either. I did not know what impact they had on the way Americans cook. The movie was not only entertaining, it was very instructive. Now, I’d like to see a movie about Marcella Hazan and the way she changed the perception of Italian food in America. Should I start a blog and cook the 365 (?) recipes in The Italian Classic Cook Book she wrote in 1973? I am no Julie, and my kitchen is smaller than hers. Also, I am Italian, and I can speak to Marcella in our native language. It might give the project more authenticity. As I overheard from several different people leaving the theatre, they were all going to the nearest book store to get Julia’s book (now back at No. 1 on The New York Times best-seller list) and start cooking. This is great – French, Italian… it doesn’t matter, as long as you start setting your foot into your virgin kitchen and start cooking. Previous Post Vote for Gustiamo and Shine a Light! Before Sept 13th. Next Post Are Private Equity Firms Bad for Food Companies? Marcella’s book got Americans beyond spagetti and meatballs and veal parmigiana. She performed the same service as julia child and it still bears fruit. Italian cooking is the most popular in America. do the movie. ciao Victor! i haven’t read Amarcord, yet. shame on me! we should have it in the office. i’ll start reading and cooking with it tomorrow! kisses to you and Marcella. 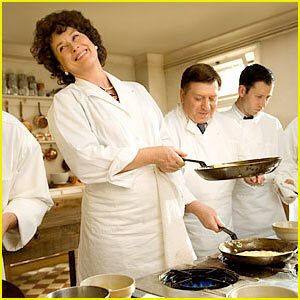 I think that doing a “Julie&Julia” type movie with Marcella Hazan would be great! (but not without it’s problems…) While I’m no Italiana and have no idea how I’m going to do this, I’ve started a blog doing exactly what “Julie & Julia” showed, except with Marcella’s “Essentials of Classic Italian Cooking”. It’ll be interesting how it’ll turn out. I’m a 4th year science student in Ontario, Canada, cooking from her book because I fell in love with the Italian culture and she’s captured some of the essence of the food in words that I hope to bring to life in my little corner of the world. I’m not sure who you guys are, but if you really do know Marcella, tell her I say “thank you”. Thank you for capturing a little bit of Italian sunshine and letting me bring it here to live and share with everyone I know. Thank you. ciao Victoria, we know Marcella well. she and Victor, her husband, read this blog and contribute (see Victor’s comment, in this thread). they are always happy to hear from Marcella’s fans. are you putting your cooking with Marcella’s experience in writing? where? thank you for your love for Italian food and for Marcella. I actually am putting my experience down in writing on a blog that I started just for this. Getting all the equipment necessary (especially a food mill!!) and fitting it into a student schedule and budget has definitely been an adventure. I hope you enjoy! Also, grazie mille for passing on the message! i hust saw your blog. bravissima! hope you’ll have the patience and time to keep cooking and writing. if you have any questions, post them here: http://www.facebook.com/group.php?gid=47438465452&v=app_2373072738&ref=mf#/group.php?gid=47438465452&ref=mf. we’ll reply immediately. we are not great cooks, but we know a lot about Italian foods. I’m trying to cook my way through: http://www.hazanessentials.blogspot.com/. But I keep getting distracted by her son’s books. Marcella’s book is the bible of my kitchen. Full of admiration for her role in promoting Italian cuisine.